Fred and Kim Goldman say they feel they played a role in putting O.J. Simpson on a path that could put him behind bars for the rest of his life. 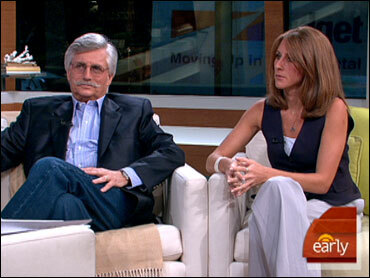 The father and sister of Ron Goldman spoke with co-anchor Harry Smith on The Early Show Monday. On Friday, 13 years to the day Simpson after was acquitted in the murders of his ex-wife, Nicole Brown Simpson, and a friend of hers, Ron Goldman, a jury in Las Vegas convicted Simpson on kidnapping and robbery charges in a case involving sports memorabilia. Simpson faces a possible life term when he's sentenced in December. Fred Goldman told Smith Monday the verdict Friday caught him by surprise. He "thought that the jury was out for the weekend. And (I) got a phone call from Kim saying there's going to be a verdict. And I went into shock. And every emotion under the sun, you know, palpitations and what is going to happen, is it going to be a repeat of 13 years ago?" "I was thinking," Kim Goldman said, " 'I can't have two not guilty verdicts in my lifetime on the same day.' We really tried to reserve judgment and opinion about what was going to happen, and I don't know how successful we were. ... We didn't want to allow ourselves to get back in that place again. We've been disappointed before and just didn't think it was possible and, you know, you don't want to put your faith back in a system that disappointed you so many years ago, so we just tried to maintain a level head and, as I said, I don't know how successful we were. I was a basket case and my dad was just stone cold quiet. It was weird." "He's been very arrogant in the way that he carries himself," Kim continued, "and, you know, especially when he wrote the book last year that we were successful in taking away from him. You know, my dad and I firmly believe that our actions over the last decade-plus drove him to sort of act out in this way, and I think the book put him right over the edge." Simpson still owes the Goldmans and the Brown family most of a $33 million civil judgment for the wrongful deaths of Nicole Brown Simpson and Ron Goldman in 1994. The Goldmans were able to obtain the rights to Simpson's controversial book, "If I Did It," which details how the murders would have happened had he committed them. "We made a promise to ourselves and to Ron then that we'd never walk away," Fred said to Smith, "we'd never back off, we'd never give up and, as Kim said, you know, I think strange terminology to use, but the nail to put him away, I think, was our taking the book away from him. It took away his opportunity to glorify himself. He expected to make a lot more money on it than he got." "He was using that as entertainment, definitely," Kim added. "He was mocking everybody with publishing that book, and the fact that we were able to take it away and use it as a confession, I don't think he was expecting that. He's been able to escape our hands for years, and we finally nailed him, and look what happened." "We turned it on him," Fred remarked. Kim said it still hasn't sunk in: "I feel like I'm going to wake up and something's is going to be different. It has hit me yet." "I haven't been able to wrap my arms around it," Fred agreed, " because, for all of these years, it's been one focus and, all of a sudden, things have changed, and, you know, other than knowing that the likelihood (is) he's going to go away for a lot of years, I haven't been able to get my emotions around it yet. I'm thrilled on the one hand, but then I keep thinking, 'Well, in December, they're going to sentence him, and then we'll really find out." "Then we have to suffer through the appeals process, you know?" Kim pointed out. "I mean, but, I just was thinking, 'He's in jail. Wow! He's not coming out!' "
"The pictures of him getting shackled in court," Fred concluded, "(were) a beautiful sight. And also, you know what? It's been 13 years. That's going to be his unlucky number and maybe our lucky number in the future. But then, on Dec. 5, I'd like to see a birthday present, and that is my birthday present -- that he goes away for the rest of his life, because my birthday is the next day."